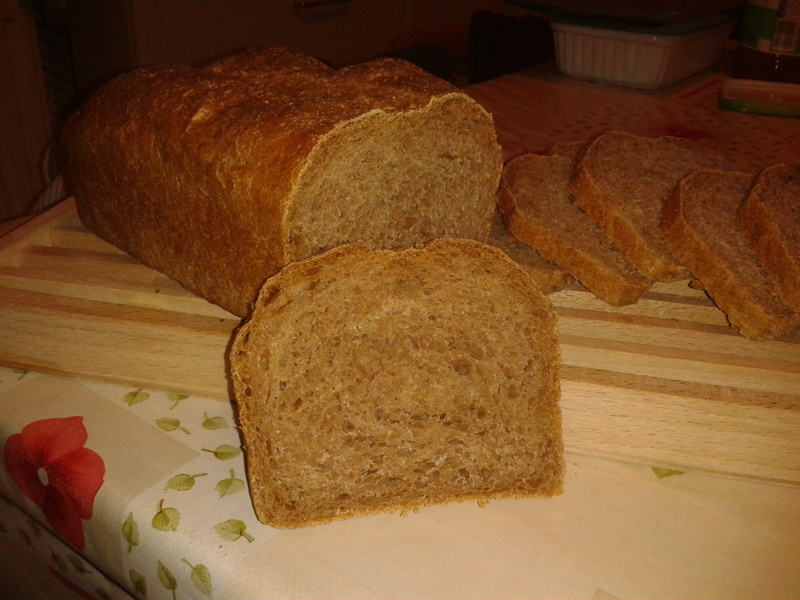 100% wholemeal bread following recipe of James Morton in “Brilliant Bread”. 1. Rub yeast with the flower, add salt keeping them apart. Add all the water and combine in a wet dough; leave to rest for 30 minutes. 2. Roll out on surface and knead for at least 10 minutes. Cover and leave for another hour. 3. Turn out on floured surface and form into a loaf according to the tin you will use. Put in greased tin and leave to rise for another hour. 4. Bake for 35 minutes in pre heated oven at 220C. Bread with kasha (toasted buckwheat seeds) as an addition; Similar dough as some of the bread with rolled oats. Distinctive taste and smell. (not a 100% success). 1. Rinse the kasha well with cold water (follow instructions on the package). Bring 200 g water to the boil and cover the kasha. Leave to rest for 10 – 15 minutes. 2. Mix the flour and the kasha with the salt. Flour will stick to the grains. Crumble the yeast in the flour, add the diced butter. Add the remaining water and mix to a light dough. Leave to rise for 30 minutes. Given the temperature of the kasha this dough will rise fast, so check regularly. and form into 2 loaves; put on a greased baking tin. Leave to rise for 40 minutes, until doubled in size. Check as dough rises fast. 3. Bake in a pre heated oven at 200 C for about 30 minutes. 2 grain types ans some additions. 1. Mix flours, seeds, germs and salt in a bowl. Crumble the yeast with some of the flour. Add most of the water and mix to a soft but not sticky dough (electric mixer). Add additional water if needed. When the dough comes free from the bowl, turn out on work surface and knead to a smooth ball. Leave to rise for 50 minutes to an hour. 2. Turn out on a floured work surface and form into 2 round loaves. 3. Bake in a pre heated oven at 200 C for about 33 minutes,until golden brown. Bread based on a “Waldkorn mix”, contains several flours (wheat, rye, oats, barley) and some sunflower, lineseed. Wheat malt and salt already added as well as some ascorbic acid. Always hard to find out the proportions of each of these ingredients in the mix. 1. Mix the flours, add the butter. Crumble the yeast with some of the flour. Add the water and start mixing. and knead for about 1-2 minutes to a smooth ball. Leave to rise for 40 minutes until doubled in size. 2. Form into a long loaf and put on a greased baking tin. Leave to rise for another 50 minutes or until doubled in size. 3. Bake for 30 minutes in a preheated oven at 200 C.
Own multigrain mix rolls and bread. 1. Bring 200g water to the boil and cover the oats. Leave to soak for 15-20 minutes. 2. Mix the flours, flaxseed, wheat germs and salt in a bowl. Rub in the butter. Add the oats and mix. Pour in most of the water and crumble the yeast. Mix to a rather sticky dough. The amount of water depends on the water absorbed by the oats. Knead for 30 seconds and leave to rest for 10 minutes. 3. Spread 1 tablespoon of olive oil on the work surface and your hands. Knead the dough again for 30 seconds or until all the olive oil is absorbed. Leave to rest for another 10 minutes. 4. Repeat step 3. And leave the dough to rise until doubled in size. Goes quite fast (25-30 minutes), dough temperature is relatively high due to the oats mixture. 5. Turn out the dough. Form the dough into rolls and a bread (or any other combination). Leave to rise until doubled in size (40 minutes). 6. Bake in a preheated oven at 200 C for 22 minutes (rolls), 30 minutes for the bread. Soya bread. Mixture of white bread flour and toasted soya bean bits. 1. Mix the flour with the salt, add the butter diced. Crumble the yeast with a little of the flour. and knead for 3 minutes. 2. Turn out on a floured surface and form into 2 loaves. Put on a greased baking tin. Leave to rise until doubled in size (60 minutes). 3. Bake in a pre-heated oven at 200 C for about 35 minutes. Another Waldkorn bread (Mon 26.04). Bread based on a “Waldkorn mix”, contains several flours (wheat, rye, oats, barley) an some sunflower, lineseed. Wheat malt and salt already added as wel as some ascorbic acid. Always hard to find out the proportions of each of these ingredients in the mix. 1. Mix the flours. Add the butter; and rub in a little. and knead for about 5 minutes to a smooth ball. Leave to rise for 30 – 40 minutes until doubled in size. 2. Form into 2 small loaves and put on a greased baking tin. 3. Bake for 22 minutes in a preheated oven at 210 C.